*Preventative Note in Case Chuck Norris is Reading: The title is not meant to imply that a woodchuck COULD Chuck Norris. Only Chuck Norris can Chuck Norris. Nor is the title asking: "How much wood could Chuck Norris chuck if Chuck Norris could chuck wood?" Everyone knows Chuck Norris can chuck ALL the wood, if he wants. Along with all the woodchucks, for that matter. Please don't hurt me. I can't recall the last time I've written "No material change," "nothing to add," "no real change," and "please don't hurt me, Chuck Norris" as often as I have over the past month or so. That's largely because this market has remained slightly less exciting than flossing your cat's teeth would be, presuming you have a cat, and presuming that cat does not wear feline dentures. This has gone on for what seems like an eternity (the trading range, not your cat's much-needed teeth flossing), especially after the rocket-launch rally that came before this extended chop zone. So, with that said, there's only a little tiny bit to add since last update. Basically, the complex (B) and (C) waves still look pretty viable. If 2263 fails, then traders should be on high alert for a decline back below 2233 -- and if 2233 goes, then even the 2200ish zone isn't out of the question. 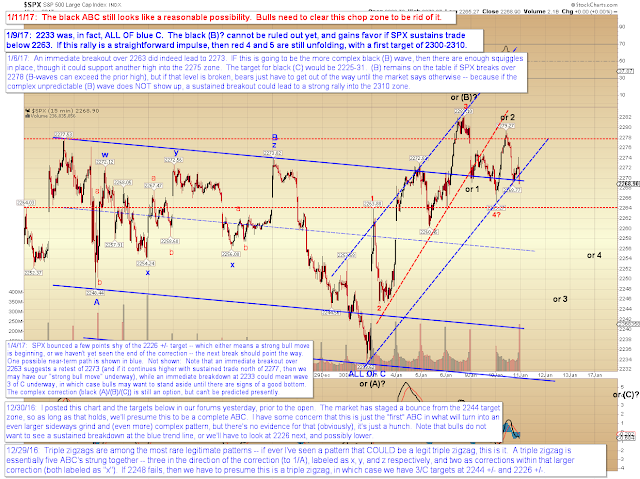 Note that SPX dipped below the blue trend channel as of yesterday's close. Bulls want to see that channel reclaimed. Bigger picture, there's also no change, and it is still presently assumed that the black (C) bottom would be a buy op for an eventual trip toward 2400 SPX. In conclusion, the complex black ABC that I first warned about on December 30 continues to look like a viable possibility. To negate that option, bulls need to clear this chop zone with a little more energy than they mustered (mustard?) on January 6. Trade safe.